This cute wooden mitten is a great gift to bring the Christmas spirit! It is filled with fresh winter greens, blue thistle, red carnations, star of Bethlehem, dark red grevallia and white mums. It is topped off with cute stocking picks for that special touch! Really impress that special person this holiday with this large centerpiece in a stunning 8" mirrored glass bowl. There are (3) 18" candles in the center to make that "grand" statement. 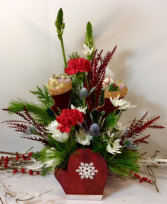 It has fresh evergreens, roses and carnations topped off with berries, glittery picks, glass balls and shiny bows. This centerpiece is about 24" long x 14" wide. Give a really fun gift this year with this whimsical owl and cardinal keepsake. 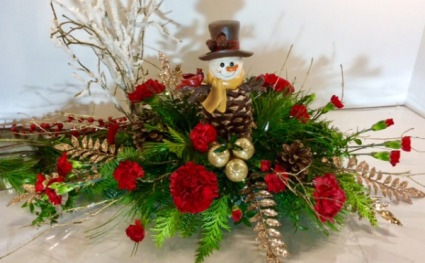 It is nestled in a bed of evergreens and contains pine cones, glittery holly branches and carnations.